After Ken Schles’s debut book, Invisible City, made an appearance on Time magazine’s list of the best photo books of 2014, I endeavoured to see whether his second book, The Geometry of Innocence, was to surpass the success of his first. In the book, Schles focuses on the relentless shifting of social structures and spaces that mark the urban landscape of today. The images capture fleeting, often blurred moments and, as mentioned in the commentary, Schles ‘sends his viewers onto city streets and playgrounds and into clubs and bars, puts them in police helicopters, and takes them to Death Row’. To a novice in the realm of photography books, it was comforting to see that the sporadic nature and ambiguity of his work was elucidated with an essay, which was just as thought-provoking as the images themselves. ‘I see us isolated within our communities’, writes Schles paradoxically. 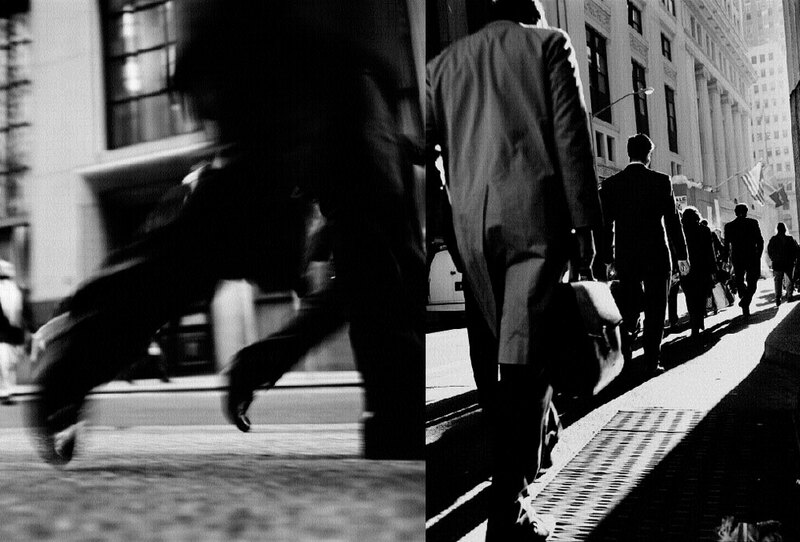 One image in black and white portrays commuters in suits on Wall Street, walking in a single file crowd. The image is scattered with shadows and an American flag waves off of a flagpole in the background. I found the most interesting part of the book to be about halfway through when it shifts to a set of portraits both posed and candid. The subjects are varied including a black South Philadelphian family, Nevada tourists, Beverly Hills bridesmaids, carnival goers, and Alzheimer's patients. It seemed like Ken Schles had pinched a photograph from the personal photo albums of random families and friends in different communities and places and compiled them for us to view side-by-side as one. It has to be said that one of the main reasons why I was drawn to the book was because of the obscurity of its title, ‘The Geometry of Innocence’. A quick Google search later and I found myself on a lyric page to Bob Dylan’s 1965 song ‘Tombstone Blues’, the lyric reads: “the geometry of innocence, flesh on the bone/ causes Galileo’s math book to get thrown”. In this context, innocence itself has a composition and is not just an abstract noun. Moreover, the lyrics are somewhat scathing of society and authority and the motif of images depicting abuse of power run through the entire song. It is for this reason that I can see some semblance of similarity between Tombstone Blues and Schles’ photo book. We see images of innocence (an image of the birth of Schles’ daughter, Julia) and countless images of authority from an ominous landscape shot of a Ukrainian church steeple to “The Walls” execution chamber, the most active death chamber in the United States. It is clear from the commentary essay that Ken Schles is moved by what he sees through his lens and shares this with us through a beautifully bound, immaculate set of photographs with each one never lending the same interpretation twice. I would recommend this book to anyone with an open mind and an appreciation of the institutionalised self.